A big problem I notice, especially among younger developing players, is a lack of attention to being assertive. Sometimes there can be a number of causes for being too passive in matches, it can be due to how you practice or to something as simple as not being focused enough. Before playing the World Championships in 2016, US National Team member Adam Hugh gave me a priceless piece of information - in a WTTC you will not be given opportunities, you need to work hard to create each chance, and when you do you need to make sure you take it. Of course at that level this is completely true, but it made me realize in my normal domestic matches just how many opportunities you get in a match to take control or gain the upper hand. It's also worth noting that in a game as fast as table tennis, against a formidable opponent you are likely to only get once chance in a point (sometimes not even one). For that reason being passive in such high speed exchanges will often tip the scale way out of your favour. One simple piece of advice is to alter your 'default' mode. You should always be ready to attack (if you are any kind of offensive player). Some players hover in on serve receive and are automatically always ready to receive the short ball. Don't. Even if your opponent is serving 90% short, your position on serve receive should be ready for any opportunity to attack if the ball goes long or loose. Moving in for a short receive is easier than moving back out to attack when you aren't prepared. A common mistake by some players is to be overly passive on the long ball. I find, particularly among developing players, a lack of confidence in backhand opening - more common in young female players. A high quality push to the backhand results in a push return, this is not effective, it's important to build the mentality which recognizes any long ball as an opportunity to initiate the attack. This comes back to practice and even practice matches. Some practice games could involve a player losing the point if they push back a long ball. As a coach there is nothing that frustrates me more than seeing young players pushing back a long ball. Opportunity lost and advantage handed back to the opposition. - Good body positioning relative to the ball and to the table. Often players can be afraid of attacking the half-long ball due to indecisiveness or fear of hitting the table on contact. It is important to get your body low and close to the ball contact in order to judge all of the above elements. Picking up loose short balls or low quality (not deep) long pushes also adds more pressure to your opponent to tighten up their game or risk being on the defense more frequently. 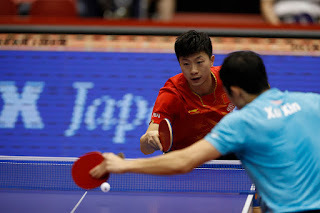 Being the initiator in a point often gives you some control over the point, statistically in table tennis matches the player who opens first holds some kind of advantage. What is important to remember is that this advantage lies with being active, not necessarily with launching an all-out attack. Even playing an opening ball with heavy spin and control can still give you the high ground to start out in a point. Consistency in opening balls is vital in table tennis, also it allows a player to build confidence against the long ball in a match. A player who overplays their attacking shots may miss some shots and find themselves less committed to taking opportunities. Of course it's not just don't to attacking, being active in a point is all about pin-point focus and can relate to long pushing and serve receive also. Hopefully the article and the links within will help you become a more assertive and active table tennis player. Sometimes you can have all the right skills, but being too passive can really hinder you in competition. Make a pact to be more focused and assertive in training and matches! I guess the reason why young players tend do be passive is that they want to win, and at the lower levels it is way easier to win by being safe and letting the opponent to make mistakes rather than to force them. The path of becoming an assertive offensive player is very long and frustrating. Before getting any advantage from holding the initiative, one will have to lose enormous times to players that just let the opponent drown by themselves.